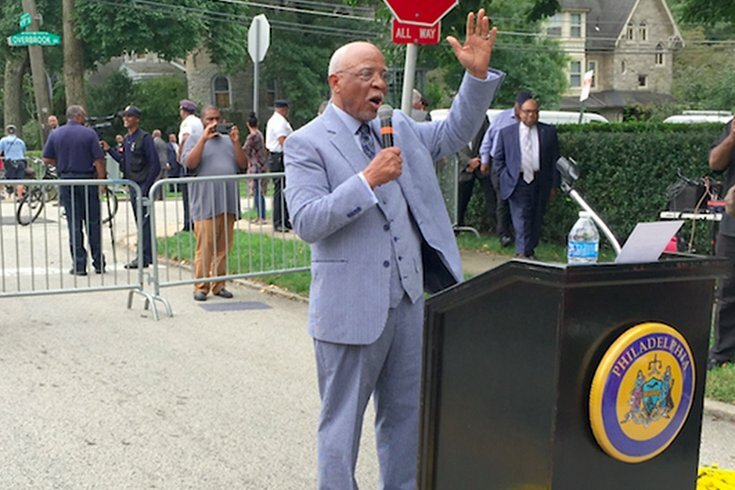 As a block in Overbrook is ceremonially renamed in his honor, former Mayor W. Wilson Goode Sr. defiantly stated that he refuses to be defined solely as the leader in charge of the city when a bomb was dropped onto a city block in May 1985. He was the first African-American mayor in Philadelphia’s history. He was the leader who bears responsibility for dropping a bomb on a city block during a 1985 day considered to be the worst in Philadelphia’s history. 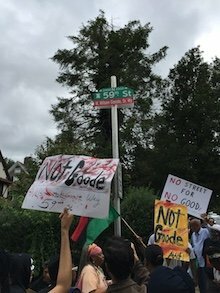 With that, W. Wilson Goode Sr.’s legacy will always be divisive, one that’s saddled with decades of pain extending well beyond the 6200 block of Osage Avenue, where 11 lives were lost and many more homes – and lives – destroyed because of the city’s fiery confrontation with MOVE. But on Friday morning, near his home in the city’s Overbrook section, the 2400 block of North 59th Street was ceremonially renamed W. Wilson Goode Sr. Way in his honor. On one side of the intersection, political dignitaries, pastors, family members and friends gathered to celebrate the honor. They spoke of the good things he did in office, and in the decades since. 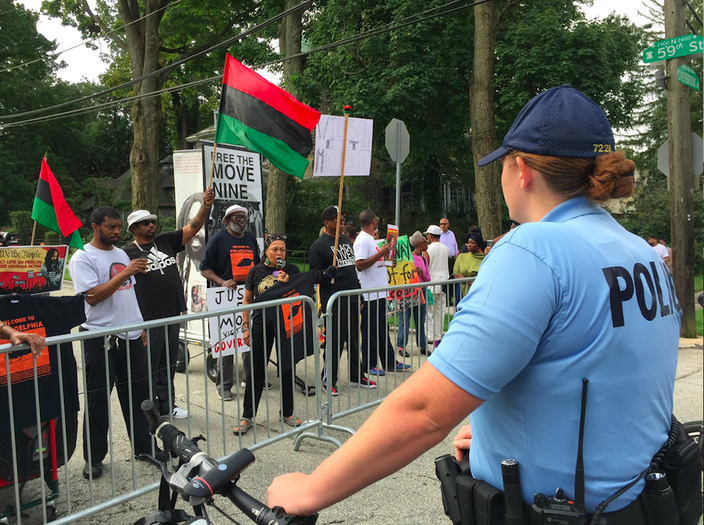 On the other side, behind temporary gates and lines of Philadelphia police officers on bicycles, a wide array of angry, frustrated protesters gathered. They not only tried to drown out the festivities with chants and music, but let their voices be heard loudly with a message of disgust that the man they hold responsible for those deaths and the untold damage was being honored in such a fashion. Before Goode spoke, current Mayor Jim Kenney took the mic and said he was a great leader who “changed the skyline of the city” and has kept busy helping a wide array of people in need in the decades since he was in office. The sign was posted at the corner of 59th Street and Overbrook Avenue. “I was happy twice to vote for you over Frank Rizzo,” he said. The 80-year-old Goode heard them and, while addressing the crowd with a message blending defiance, humility, taking responsibility and compassion. “It’s time to stop beating up on each other, protesting each other. It’s time for us to do the work to get something done,” he said. “I will not let them, or anyone else, define me as one day of my life. I refuse to do that. Profane responses echoed from across the street throughout, but he turned his back to the audience and walked toward the police barricades, addressing protesters directly. That sentiment didn’t sit very well with protesters at the scene and from afar, who are aghast that the city would rename a street after a mayor responsible for so much death and destruction. They included Maisha Sullivan-Ongoza, who lives in the neighborhood where the street sign was erected. Noting that some neighbors were opposed not only to the sign, but to City Councilman Curtis Jones Jr.’s support of it. She said Goode should “be a bigger man” and reject an honor that “opens up old wounds.” The red on the street sign, protesters said, represented the blood of those killed on Osage Avenue 33 years ago in May. “Atonement is between him and his god,” she said. “This sign is a symbol of disrespect, disregard and disenfranchising my community. We have to honor the dead. Also speaking at the protest was Pam Africa, MOVE member and activist, who blamed “dumb, ignorant n***** Wilson Goode and the white supremacists” for the lives lost. For her part, Sullivan-Ongoza said they will work until that sign is removed, and threats of that happening in a fashion akin to the defacing of the Frank Rizzo statue in Center City have already been made. 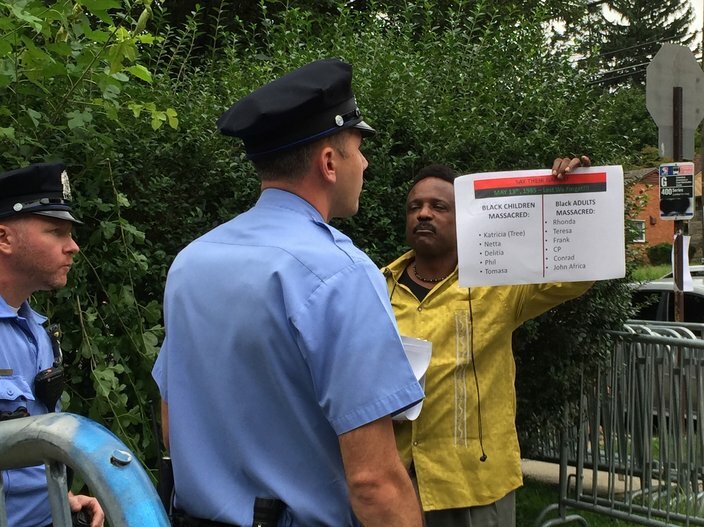 A protestor holds a list of the names of those killed in the MOVE bombing just feet from a pair of Philadelphia Police officers. Kenney backed up Goode’s stance that he shouldn’t be judged for the actions of May 13, 1985, but the totality of his work. He also noted that Goode was not entirely responsible for the decision to drop an incendiary device atop the MOVE home in West Philadelphia. Moments later, protesters would gather around the street sign, saying prayers for those whose lives were lost and vowing that the effort will not stop today, but when that sign is torn down.